A person that wishes for all people to be his friend. Unrealistic…here’s a challenge, try it yourself, see how far you get. And most of all, a human being who has an incredible desire to live with more compassion each day, because I feel a life minus compassion is meaningless. Great info on your blog .I look forward to reading more :=). Thanks for stopping by my blog and leaving your comments, especially the poem! Seems like you’re a man of many talents. Wishing you a great week. I agree that life minus compassion wouldn’t be worth living. I do try to live a conscious and compassionate life myself but sometimes I fail to live up to the goals I set. I enjoyed reading your site. I’m ok on the guitar, I’m just teaching my 13 yr old daughter who is doing really well. If you have any magic dust that will turn me into the next Hendrix then send it over. I just started listening to Angus & Julia Stone and agree they are excellent. I am going to see them in Brighton (bottom of England) on May 1st. If you have the chords for Here we go again, then email them to me and save me a job, thanks..
Get your daughter to listen to Gregory & The Hawk and Joanna Newson if she hasn’t already, both are great. This is just a quick note to let you know of a new website that may be of interest to you and your members. It provides quite a useful source of information and should be a useful tool for the many guitar enthusiasts who visit your blogs. The Street Musician – Top 100 Guitar Blogs shows the best guitar blogs on the internet and their positions collectively ranked by Google PR, Technorati, and Alexa rankings and is updated daily. It is a great source of information and also includes a Recent Posts page showing all the latest posts from the listed guitar blogs. Your blogs are also nicely ranked on the list so feel free to contact me if you know of any other blogs we can add in our search for the best on the net. Thanks for dropping by. I have checked out your directory/site, great idea and good resource. You’re blog is fantastic, really interesting stuff! Looking forward to seeing the developments with your site. I love what you’re doin’ here. I especially love the bit about being friends with everybody, I figure that to some extent I already am your friend. This guy is quite a good player. Not sure what country he is from, he doesn’t sound American. He sort of reminds me a bit of Mick Goodrick without the tension. Good arpeggios and nice chords, I don’t know that piece. Tony, I just got on your terrific site and really am impressed with all the great videos you posted. So many great guitarist for sure! Loved the singing as well. I went through many of the videos on the first page! If you have the time, I have over 270 pieces of fingerstyle guitar music available for free! Just discovered your blog… love all the youtubes! Please tell me you have heard of Monte Montgomery? If not you are in for a real treat! Don’t think he’s been downunder… way… I beleve he’s just started hitting some euro dates in the past few years! He and his band are a must see live show for anyone into guitar/power trio! I don’t even play acoustic guitar(bass), but I love listening to it played well! Thanks so much for pointing out that other site that is taking my content. I think you have a great blog here and will add you to my blog roll. I would like to create healthy relationships with other musicians on the web. The role of my site is to educate and inspire and is not to create income for other people who have not enough skill or understanding of music of their own to use as content for marketing purposes. Hi Tony, my name is Ava and I’m over at Jemsite (http://www.jemsite.com/) We do a guitar series over at the blog (http://www.jemsite.com/blog) called the Guitar Heroes series where we interview guitarists and musicians every week. We wanted to interview for this week but I failed to find your contact info on the site. If you could write to charismaqueen100@gmail.com, that would be most appreciated. I would rather tell you about all of this through e-mail rather then through comments. I felt its a pretty neat and easy way for learning to play guitar, but yet to decide whether to buy the full package (I have taken the 1st lesson package tough). They have a 3d animated interface where while learning we can zoom in and out and see the exact finger placements of the instructor, also control the speed with which we want to learn. What do you suggest…..your comment would be of great help. Trisha. It’s inappropriate for me to evaluate someone’s product like that, it would be sort of unprofessional, although I’m not a direct competitor to them and am not marketing learning products, I am in a way another web resource and I would not like to create any disharmony with anyone, the more resources that help people create better music the happier I am. I have never heard of these guys, but it’s a big web. I thought the site was really cool. Thanks Trisha! Hey Tony, came across your blog, nice work!!! Even the score, is that musical joke? You’ve got a great site here. We are really enjoying it! Very informational and educational for acoustic guitarists like us. Thanks again for the great site. Looking forward to new material. Hello,my name is Pete Swanson of Dagmar Custom Guitars. I recently made my debut at the Montreal Guitar Show just this past July. I have a new take on guitar construction and the attention my design has been getting is pretty crazy! A lot of unbelievable opportunities have presented themselves. My Facebook page – become a fan and get the low down as it happens! A great article revealing a new pickup technology that I will be helping to develope and debut on one of my guitars with Professor Hans Peter Loock of Queen’s University. I don’t have any Kaki King tutorials. A good starting point is to find out what tunings she uses and from there, become familiar with the tuning by playing some simple melodies and chords. And then, start to see what other tunes are available in the same tunings and work your way towards playing her material. I thought I would say hello. This is Gerry Cott – former lead guitarist and co-founder of The Boomtown Rats. I have just recorded a solo acoustic fusion guitar album URBAN SOUNDSCAPES. For a sample listen please hit http://www.gerrycott.com and tell me what you think? All the best for 2010. Just found your site by landing on your blog post about Olson Guitars. That you are featuring some of the best of the best in terms of luthiers is great. I’d like to invite you to check out Lichty Guitars, http://www.lichtyguitars.com. I am one of the new luthiers on the block and my guitars have some pretty fabulous musicians excited. Hope you’ll check my work out. Thanks for generating great content and great conversations. I really enjoy coming here – as a fellow Australian guitar website person I’d like to catch up with you – please email me. ERIC WILSON “Folk Singer/Songwriter of the Year” – 8th Independent Music Awards for ‘People’s Choice’ Album “THE TWENTIES”. MTV features singles “Smokescreen” and “Now” in “The Real World” and “The Hills”. ENTIRE Debut Album is licensed for TV! *Album Credits: ERIC WILSON – Lyrics, Vocals, Acoustic Guitar, Electric Guitar, Music and Arrangements for the 11 song recording. I came across your blog a few days ago. Great work. Cheers for a great resource for guitar insights. I made a couple of videos for Preston Reed below. They may interest you or may have seen them already. I look forward to your subscription. Great blog. There is a popular Youtube artist who covers songs acoustically and even writes her own. She taught herself the guitar last year and has gained followers all over the world. You can check her out at http://www.youtube.com/anhaylarene. 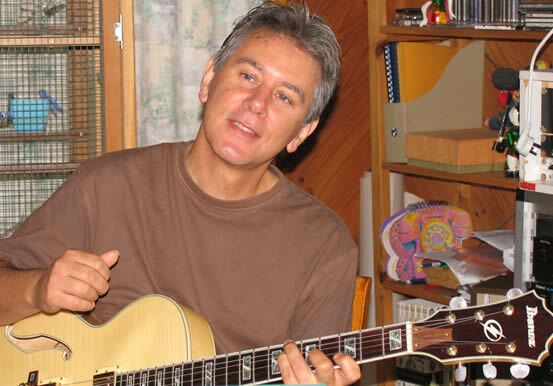 Hey Tony- I was searching for cool acustic guitar sites, and I came acorss this one! I am a touring singer/songwriter based out of Denver, CO. I just wanted to send you a quick hello and hopefully introduce my music to you. Feel free to take a listen at the websites below or visit my profile page on my PR site, Ariel Publicity (http://arielpublicity.net/clients/2773/). Recently I co-released a stripped down version of “Melissa” with Davy Knowles (Back Door Slam, The Rhythm Devils/Grateful Dead). So far it’s been getting a great response! Not just a great guitarist but a good singer too, Tony. You can find out who I am at my blog site. Can I get your comment on this? I am working with a Philippine young lady born with no arms and just foot-stubs on her hips. She would like to be a singer. I have a few videos of her on Youtube (here is one link of her writing, to show her dexterity http://www.youtube.com/watch?v=FFU4pGnnA1M, and another of her singing http://www.youtube.com/watch?v=BCVKna3h82M&NR=1. (Both as a 16-year old, totally untrained. She is now in school, at the first grade level, rapidly catching up.) My question is per the guitarist Tony Melendez, who is armless and plays the guitar. Do you have an idea on the tuning of the strings? (I’m a guitarist, so I know the tuning can be simplified for bar chords.) I’m wondering if a 3/4 guitar could be used by her. She obviously has to have some help, but she walks, can pick up coins, is learning to play piano and read music. Thanks for your input. I think what is important when it comes to tuning that a tuning is used that suits her voice and not necessarily what anyone else is using, I will think this through to see what I can come up with that might be suitable. The idea is to remove as many obstacles as possible and minimise the effort involved. This would also include choice of material, and i guess what i mean by that is to choice songs that don’t jump arouind too much into different keys and stick pretty much to a 1 4 5 type of pattern, this way the guitar could be tuned to an open chord (1) the fifth fret would be 4 and the 7th would be the 5 chord e.g in the key of D , it would be D G and A , the guitar from bass to top would be D A D Fsharp A and D, to play in the minor, just retune the 3rd to F. Whereas if the the voice was more suited to G , it would be G open , C at the 5th a barre and the 7th would be a D chord. The guitar would be tuned tuned from bass to top D G D G B D , for your minor, drop the 2nd B string to Bflat. I think you need tro establish the most comfortable key for the voice and then decide from there. And that won’t be too difficult deciding on a tuning once you know what suits. Otherwise you are trying to adjust the singer to the guitar or to someone else’s way of doing things, and that is back to front. Get back to me please. I’d love for you to watch my recently completed Youtube video in HD. I’m a percussive acoustic player heavily influenced by Kaki King, Michael Hedges, and Preston Reed. Let me know your thoughts!